Ive been doing some research into improving the security of my Tor connections and came across two sites. 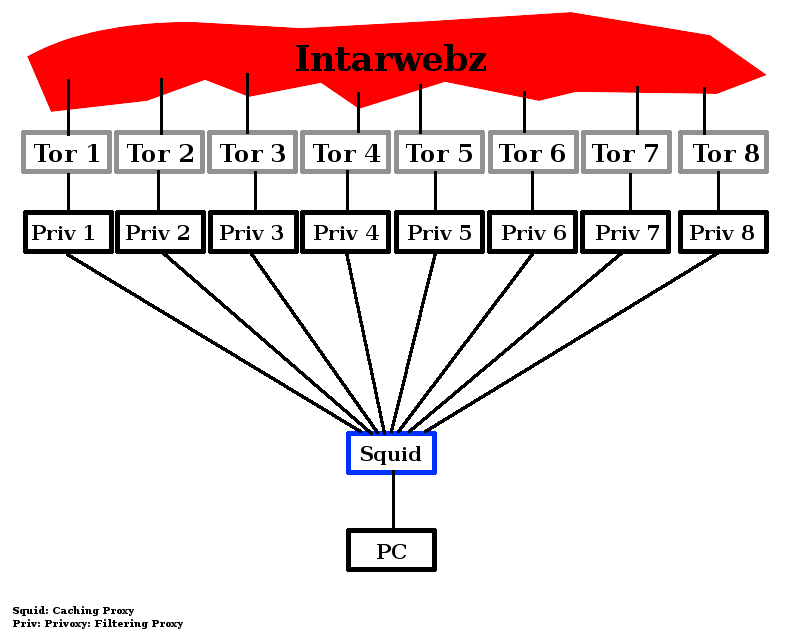 They both advocate the use of multiple Tor and Privoxy services running simultaneously and managed by squid. My concern is that the guides where written in '08 and '09. Are they still valid? Is there a better way of doing things? This is pretty cool setup, I haven't seen anything like this. It spreads your http-session between 8 different Tor exit nodes. Cool idea, I like! Since Firefox always tries to use "Connection: Keep-alive" and since most websites use not more than 2 different domains (for static & dynamic content) I think there is no sense in 8 different tor's. 3 will be far enough. So the use of 8 Tors and 8 Privoxy would be overkill? Would it improve my bandwidth over Tor though? Also should I be using Privoxy, I have been reading around and saw mention of Polipo. I don't really understand the difference other then that Privoxy seems to be actively maintained. Privoxy and Polipo are both http-proxies with the ability of making "cascade" with parent socks5 proxy (which is tor). You can use any.